After I realized that as long as I eat keto, I’ll need to add more salt daily, I started drinking 4-6 big glasses of salted lemon water or what I call Keto Lemondae daily. 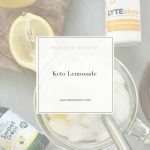 It's a lifesaver to help minimize symptoms of keto flu. It’s basically salted water with lemon, stevia and (optional) electrolyte drops. These days I don’t even add stevia because I’ve gotten used to the taste of salted lemon water – it's yummy! 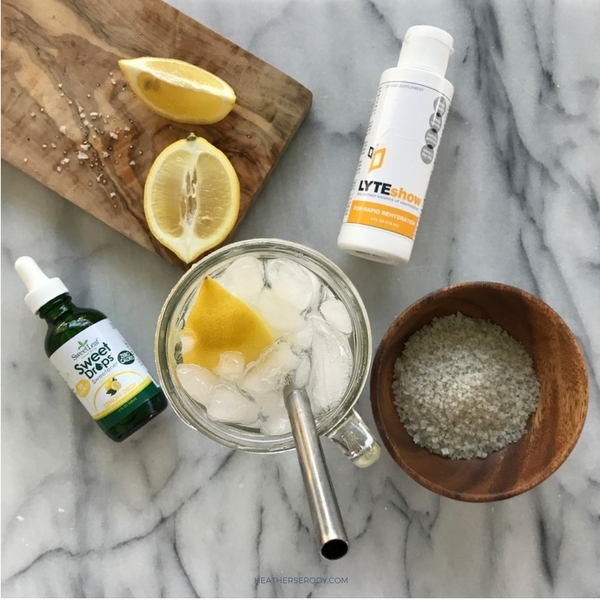 If I’ve had a few glasses of wine the night before, or realize that I’ve allowed myself to get a little dehydrated, or know I’m going to sweating like crazy at Flywheel class, I’ll always add electrolyte drops to my Keto Lemonade to help replenish my body. I drink my Keto Lemonade from a glass Ball 24 oz. wide mouth drinking mug. I also always a wide stainless steel straw that seems to help me get the most water down for every sip I take. This straw does a great job of stirring up my Keto Lemonade so the salt is dissolved quickly. Add ice cubes to a 20 oz. glass. Squeeze in lemon juice and add salt & optional stevia &/or electrolyte drops. Add water to fill and stir well with your straw or alternately use a glass with a lid, cover and shake well to dissolve salt and combine all of the ingredients.